STOCKTON 99 SPEEDWAY, SATURDAY, SEPT. 25 -- In lap-9 Wilton’s Jason Fensler, in the number 22 late model Chevy Monte Carlo, worked his way into the lead from the fourth position and held it through to the checkered flag in the Second Annual HAVOLINE/CL BYRANT/BUDWEISER CALIFORNIA STATE OPEN COMPETITION 100-LAP CHAMPIONSHIP. 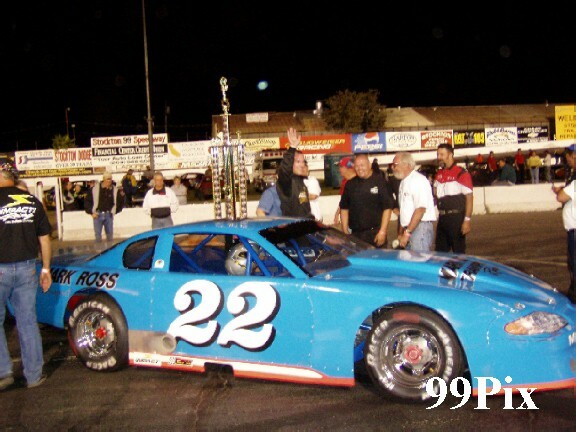 The win was Fensler’s third 100-lap victory at Stockton 99 Speedway in 2004. 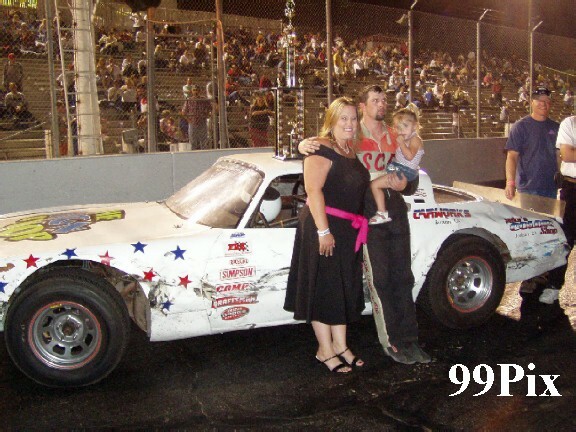 His first two were earned during the July 4 and Sept. 4 HAVOLINE Tri-Holiday Classic races. 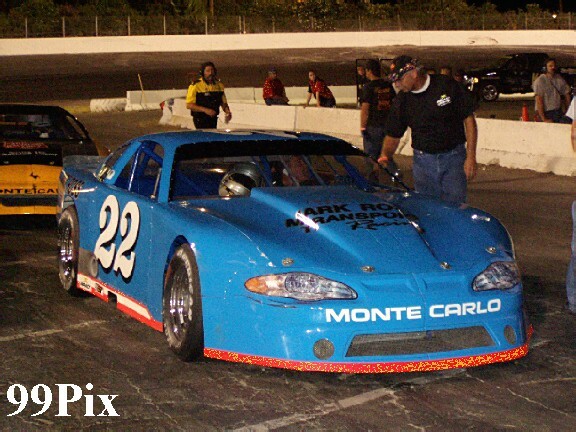 A good car, like the number 22, which has won $20,000 and 22 of 27 races in 2004, might be one of the keys to victory, but fans who saw Fensler Saturday night know that driving skill played a role in the win. 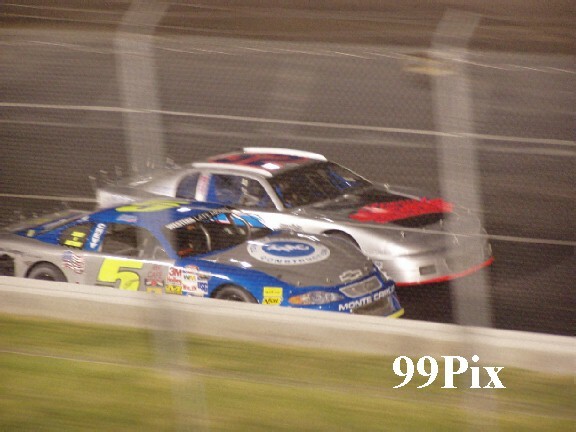 The 100-lapper on the quick quarter-mile oval opened without a hitch, by lap-12 one caution flag had flown, Fensler was holding steady in the lead and track regular Pete Anderson Jr.#5, of Stockton, and Roseville’s #61, Shannon Mansch had worked their ways into a door-to-door battle for second and third place. 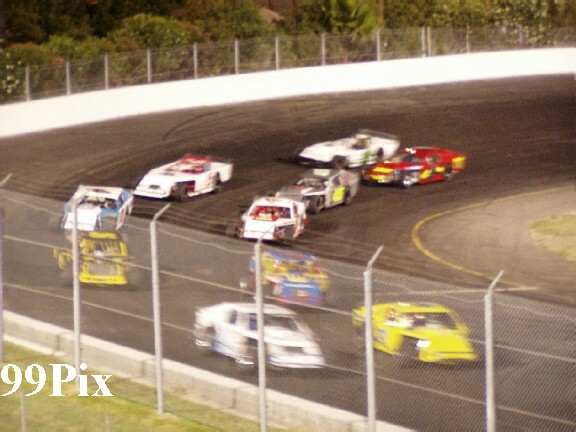 Then, on lap-24, the crowd started seeing some excitement when Turlock’s #18, Wes Miller worked his way up past Anderson Jr. and Mansch en route to a play on Fensler. 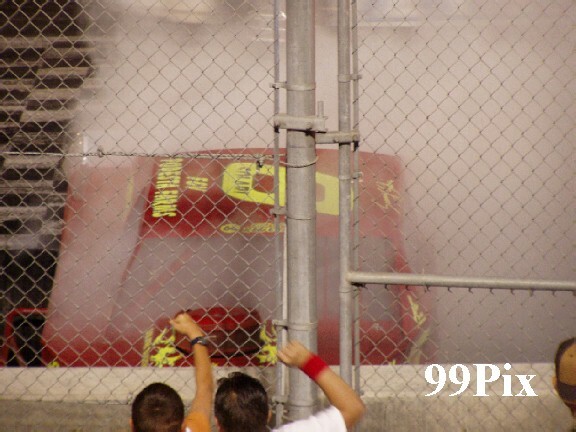 But, a couple of laps later Miller would slam into the infield fence, which moved him to the back of the pack, car trouble would later take him out of contention and ultimately the race. 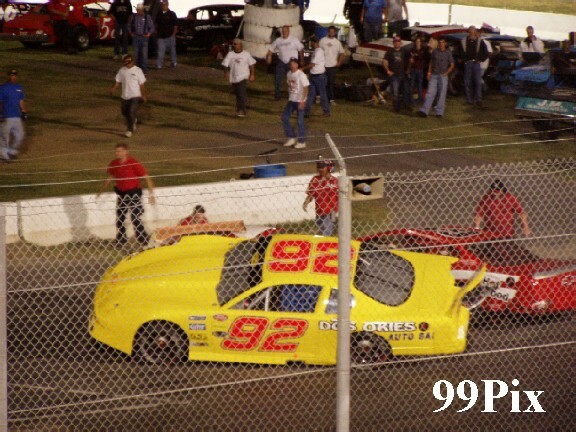 Fensler held a strong lead from lap-30 through lap-46, when a caution flag flew that led to a Texas restart where Fensler was out front with Mansch and Anderson Jr. behind. 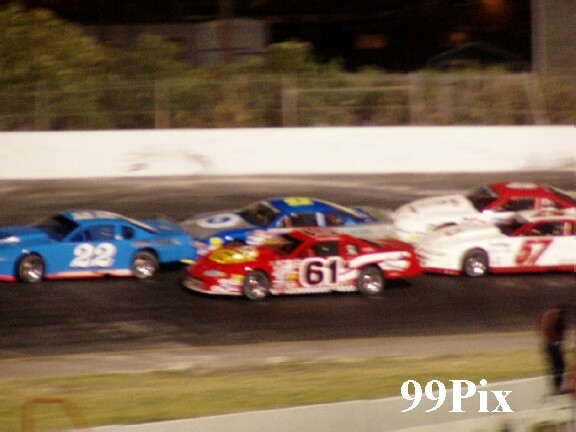 Just seconds after the green flag, Sacramento’s #57, Billy Butler, Mansch and Modesto’s, #92, Scott Masellis tangled in a front straight hair raiser. After the smoke cleared, the crowd held its breath only to be relieved after Mansch, who appeared to be pinned by Butler’s car that had T-boned her’s, emerged unscathed. 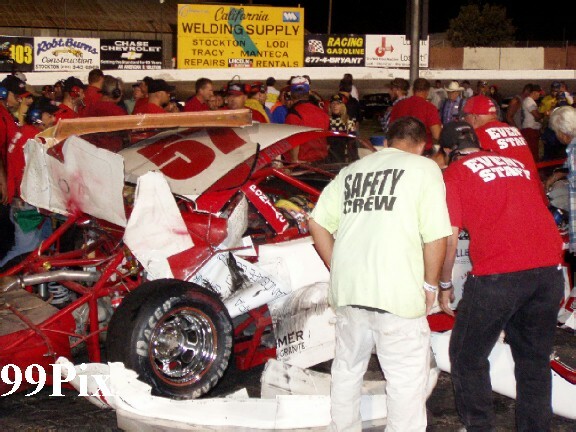 Butler’s car, sandwiched in between Masellis and Mansch, was demolished, Masellis was towed to the infield and Mansch was towed off the track. Fensler managed to avoid it all. 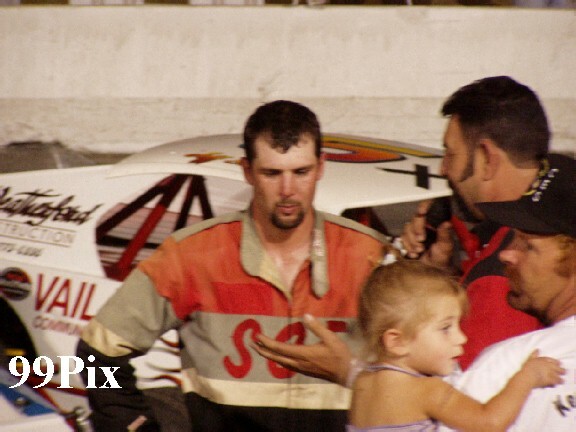 By the time the green flag flew, Fensler’s real challenger, Mansch, was out of the race, and with only 10 cars remaining out of an opening field of 17, he slid to victory, lapping all but Anderson Jr. and Stockton’s#8, Joey Stearns, the second and third place finishers. Masellis gave the crowd a first-hand look at the important relationship between a driver and his pit crew. 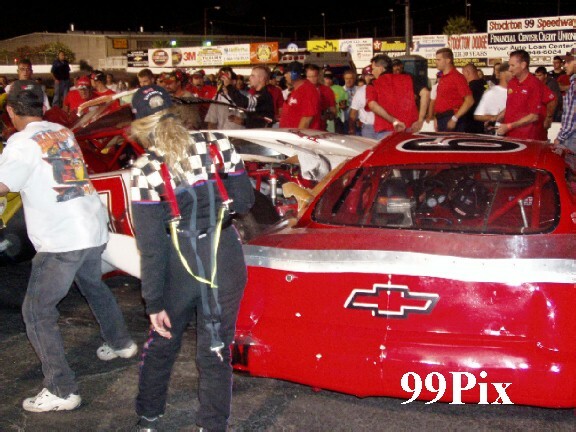 After the collision, Masellis was detangled from the rear of Butler’s car and towed to the infield. It looked as if he -- along with Mansch and Butler -- was out of the race. But his crew kept cool heads, came together, did some work that some fancy duct tape surgery and got Masellis back on the track. By the waving of the checkered, the Modestan had earned fourth place. During qualifying Miller set a new Open Comp track record of 13.826. 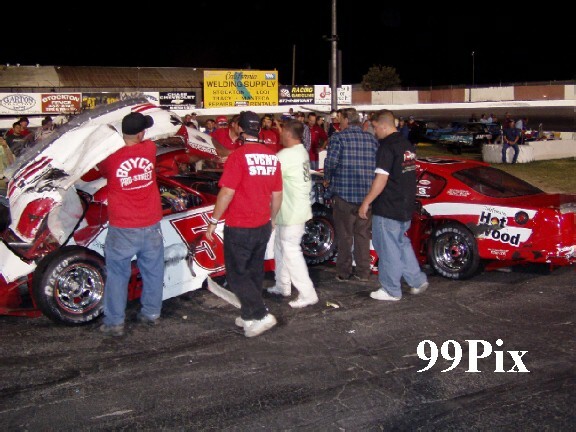 Stockton’s Gary Shafer Jr. riled the crowd following his 50-lap Pure Stock win when, from the winners circle, he commented that fans of Modesto’s Charlie Clawson, who were used to seeing him wave during races as he passed the grandstands “Didn’t see him do any waving tonight.” The crowd, many of whom seem to gravitate toward Clawson and his number 15 Camaro, responded with a round of boos! 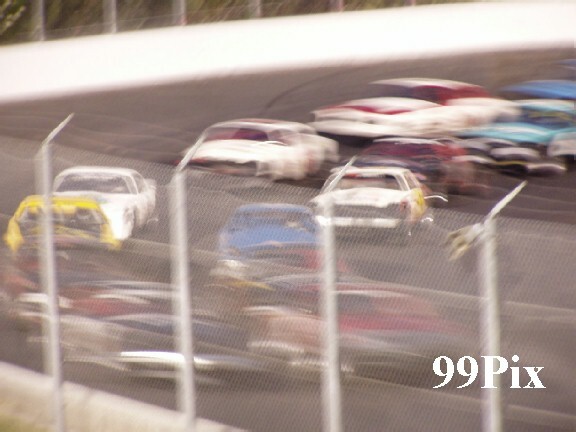 But, sometimes, on the track, rivalries are part of what pumps excitement’s pistons! Shafer Jr., who was last year’s Pure Stock champion, returned to the open competition show after a successful rookie Western Late Model season, where he won one main event. 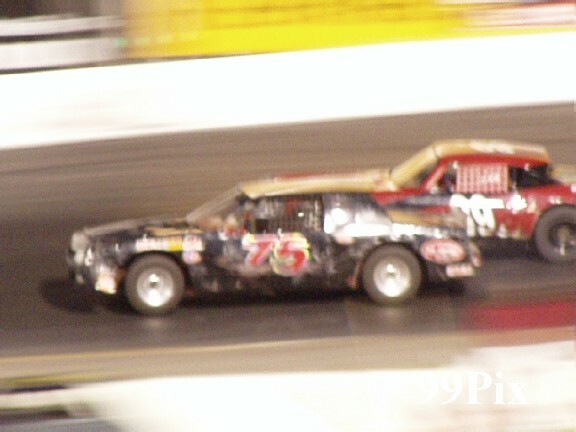 Shafer Jr. started nine deep in a 20 car field, by lap-11, after competitors like Stockton’s, #75, Chad Holman and Clawson began suffering from car trouble, he took the lead and held it through to the end of the race. During qualifying Shafer Jr. set a new Open Comp record of 16.409. Stockton’s Joe Allen grabbed a quick lead in the Grand American Modified 50-lap main event, but Roseville’s Tim Smith was quick to nab it away. 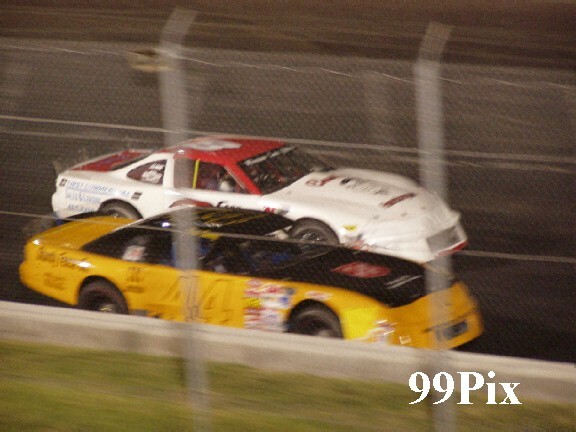 Allen and Smith exchanged position during the first few laps, until lap-7, when Galt’s Jason Kerby, right, who had worked his way up from the back of the 14-car pack to third, began to make a play for first. 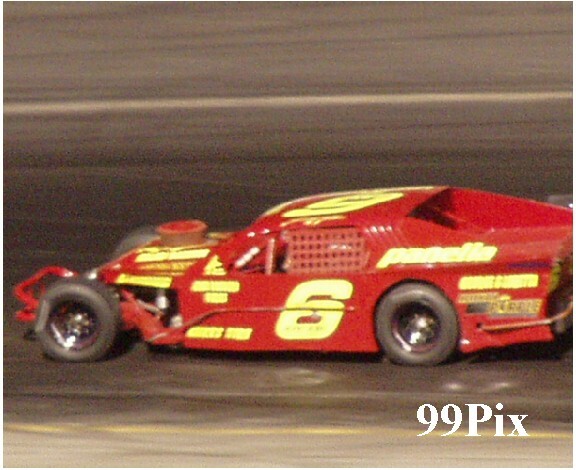 It looked as if Kerby, this season’s Grand American Modified champ, was going to overtake the leaders when suddenly, in lap-12, he lost control of his steering and had to leave the track. With Kerby out, the race became a battle between Smith, who had taken first, Paul T. Henry, of Big Oak Flat, Modesto’s Mike Beeler and Salida’s Sam Solari. Solari, by lap-37, had control of the lead -- ultimately wining the race. 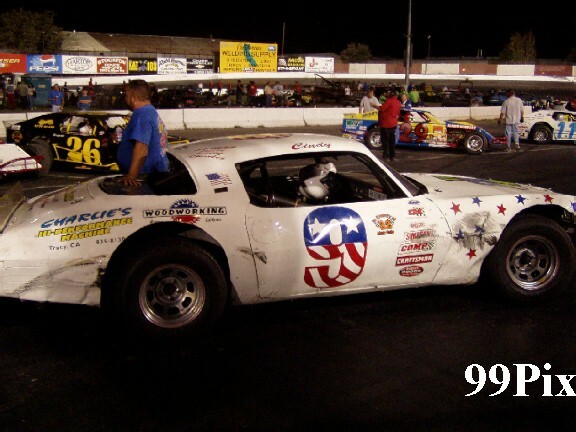 The victory was not only come-from-behind, it was also come-from-the-pit, as during the race’s middle Solari left the track and had to have a new tie rod put on. 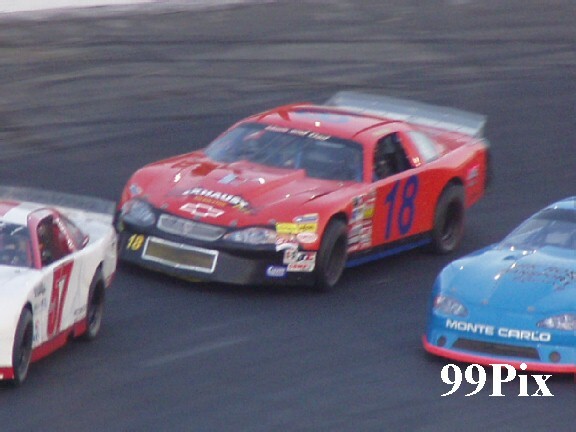 The HAVOLINE/CL BYRANT/BUDWEISER CALIFORNIA STATE OPEN COMPETITION 100-LAP CHAMPIONSHIP concluded another successful race season at Stockton 99 Speedway’s quarter-mile NASCAR oval. 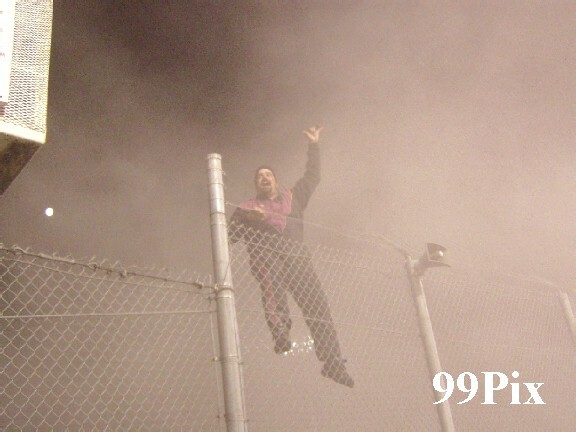 In all, fans enjoyed another fantastic NASCAR racing season. Champions crowned included Pacific Grove’s Dave Byrd (Western Late Model), Byrd (Western Late Model Tri-Holiday 100 Classic), Kerby (Grand American Modified), Saratoga’s Carrie Miller (Pro-4 Trucks), Galt’s John Medina (Pure Stock) and Stockton’s Danny Snow (Pure Stock B). San Lorenzo’s Mark Bailey took the Legends title. 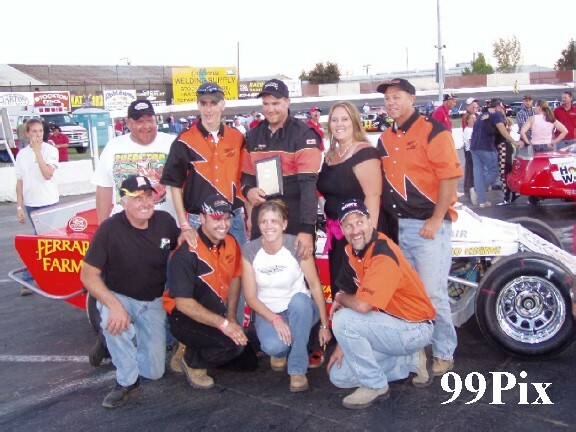 In addition to regular division racing, Stockton 99 Speedway fans were entertained during DODGE Weekly Series racing by two Auto Zone 125 Southwest Tour events, two SRL Wild West Shootout events, two DODGE COUNTRY/HAVOLINE/NAPA AUTO PARTS Grand National Western series races, USAC Western States Sprint Car races, two BCRA Midget championship races, FORD Focus Midget races, BCRA Vintage division exhibitions, a school bus destruction derby, car show and Kid’s Night. 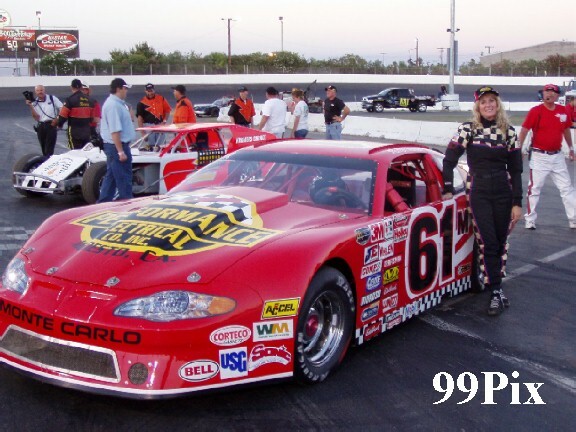 The final event of Stockton 99 Speedway’s 2004 NASCAR season will be the Saturday, Nov. 6 awards banquet in Stockton. During the banquet such honors as Sportsman of the Year and Rookies of the Year will be bestowed. 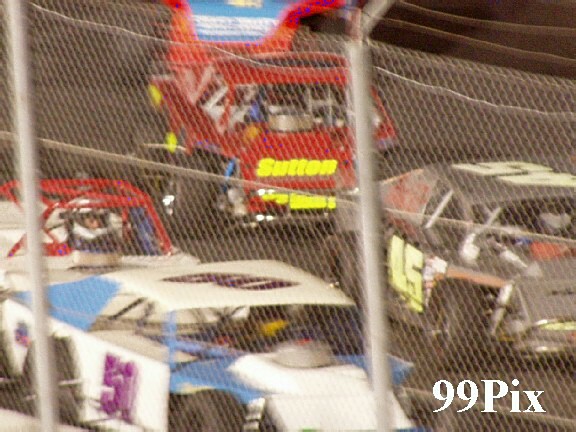 For more information on the banquet see www.Stockton99Speedway.com.